The 1.3-liter A1, pictured, is fitted with manual transmissions. SHANGHAI -- Three products of Chery Automobile Co., two compact sedans and a small SUV, arrived at dealer showrooms in Serbia in early March. The two cars are the 1.6-liter A3 and the 1.3-liter A1. 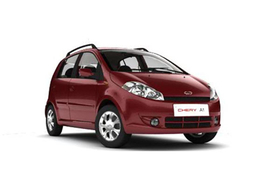 Both are fitted with manual transmissions, according to information Chery released on its Web site. The SUV, which is called the Tiggo, has a 1.6-liter unit mated to a manual transmission and a 2.0-liter version linked to an automatic transmission. The three models will be distributed in Serbia by a local company named Kamor Vehicle.